Parent Effectiveness Training (P.E.T.) teaches parents specific communication and conflict resolution skills to create and sustain effective and enduring relationships with their children in all circumstances. 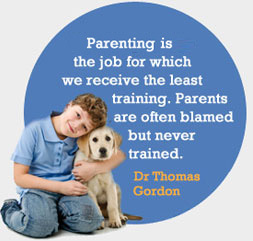 The Parent Effectiveness Training course is made up of 8 x 3 hour sessions. The program is generally delivered; over 8 weeks, 3-4 full days, or 5 half days in a group setting or individually by arrangement. Group size varies but usually between 10 – 12 participants. Parent Effectiveness Training is designed to involve you in an active way drawing on your own life experiences, circumstances, problems and perspectives. Activities include role plays, group discussion, sharing, reflection as well as instructor presentations. Explores the characteristics of the effective parent and some of the beliefs that limit us as parents. Introduction to the Gordon Model and how it supports parents with their communication and relationships. Introduces a method of understanding different behaviours and what techniques to apply in which situations. Describes the concept and importance of identifying ‘who owns the problem’ within the family thus alleviating some major stressors for parents. Addresses some of the myths of parenting which is very liberating especially for the modern parent. How to recognise and help your child when they have a problem. Avoiding the communication that results in ‘road blocking’ communication with your child. Listening actively so your child feels heard and safe to express their upset. Problem solving method to help your child learn to solve their own problems and become more independent. Questions, skills practice and scenarios. How to communicate to help build a strong relationship with your child. the child’s awareness and resilience. A deeper understanding of anger, what is beneath it and how to manage it. Questions, skills practice, and scenarios. What the harmful impacts are of the authoritarian and permissive methods of parenting. Understanding how our normal ways of resolving conflicts harms both the relationship and self esteem of the child. Learning a new method to resolve conflict that actually builds the strength of the parent-child relationship and the confidence and resilience of the child. Introduction to the ‘no-lose’ method of conflict resolution that cares for the needs of parents and the child. Learning to identify our own and our children’s needs and how to start to met them. How to apply a method known as the ’Six steps to Problem Solving’. Understanding values collisions and how they impact all our relationships. Options for resolving values collisions harmoniously. How can we be an effective model and consultant when our children are behaving in ways that are different to our ways? Understanding difference and how we can live with others who are different to us. Self acceptance and how to support yourself as a parent. How to manage your time effectively within relationships.